Is there a way to find out what tags or primary tags are linked to a certain community homepage? 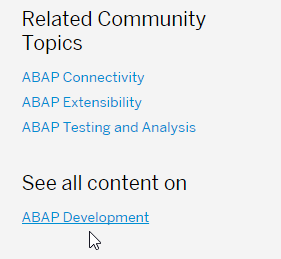 The community "SAP Environment, Health, and Safety Management Community" lists blogs and questions. But how does the system decided what blogs and questions it is displaying? As far as I understand the new SAP Community that can only / should be based on tags. Therefore I'm wondering if SAP could be so kind and display as information the tags it using to collect the content. I'm sure users would like to know what Tags they should use so their content gets displayed on a certain community. Or is there only one Tag per Community? That would be certainly over complicate the whole use of the system in my opinion. Or did I miss the blog where this topic is explained? While the community topic pages are based on specific tags, they are not automatically displayed in the UI. This would be a good idea - I suggest you add it to the SAP community ideas site. Note that the community topic pages should have links to the associated tag or tags under the "See all content" header on the right side. These links go to the respective tags. I can try to explain - I am not a SAP employee, so what I have found out, might change in the future. This long number, which you see, is the technical tag ID of SAP Environment, Health, and Safety Management. All content, which has this tag in the metadata, will be displayed in this tag page. In this case you will see only content of type question, which have this tag ID. When you create content, there is a tag picker with type-ahead functionality (which you already tried). So far, this is the easiest way to find out what tags are available. Thanks for all the explanation. The Excel link was particularity helpful. However the main question: how can I see which which blogs and questions and therefore what tags belong to a certain community. I think this functionality is missing at the moment. I did a search of the tag in the Community Search Page and in the search added "tag".... for example "materials management tag" .... this then appeared "All Questions in MM (Materials Management) - SAP Answers" then clicked it in the result pane and then clicked on follow. Click on "followed activities". Now I have to wait if I receive any mails! !